GRAND PRAIRIE, TEXAS (Feb 16, 2011)- In collaboration with FYI Television, Inc. (FYI), McClatchy Newspapers affiliate, Fort Worth Star-Telegram has quickly and successfully launched their new subscription-based TV Book, TV Star Plus. 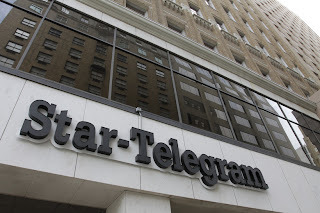 With over 15,000 new subscribers in just short of two weeks, Fort Worth Star Telegram anticipates generating approximately $500,000 in new revenue for 2011 through the continued growth and expansion of the well-received TV Star Plus. TV Star Plus is designed to serve Star-Telegram readers with the most comprehensive TV listings and entertainment information available in Fort Worth and Dallas. The new TV Star Plus offers readers a comprehensive look at what's on TV each week alongside new entertainment content that includes expanded broadcast movies, cable movies, "night owl" coverage and added Sports Trivia, TV Trivia, Celebrity Q&A, Celebrity Close-ups, 7.5 pages of color comics and 7.5 pages of puzzles and games. Fort Worth Star Telegram subscribers are given the opportunity to opt-in and receive the comprehensive TV Star Plus product for a fee of $2.50 per month. TV Star, the TV information book previously distributed to all readers, will continue to be circulated for single-copy newsstand buyers only. Subscription-based TV listings products have grown as an alternate solution to newspapers' traditional TV book model. They provide readers improved product offerings and a more comprehensive TV information experience, all while allowing newspapers additional revenue-generating opportunities. The creation of niche, subscription-based product solutions has been a conscious goal for McClatchy for several years. In June of 2010, News & Tech stated, "Three years ago, McClatchy identified niche publishing as being among its top-five growth areas and has grown its niche segment in recent years to more than 240 different titles, with distribution in excess of 7 million." McClatchy's Fort Worth Star-Telegram worked closely with FYI Television, the Grand Prairie, Texas-based TV listings and information-based company, to ensure TV Star Plus debuted successfully. "It was a pleasure working with FYI to revamp our TV book into a paid model. They worked quickly to set up what we wanted, and made great suggestions about how we could maximize our space. If there was a problem, they solved it quickly. They provided research to help us make some decisions, and the end result was a book that hit our revenue and circulation targets right out of the gate. I wish all our vendors worked like this.'' says Jim Witt, Executive Editor of Fort Worth Star-Telegram. FYI Television has been working with newspapers nationwide to successfully switch to subscription-based TV book models since early spring of 2009. "In 2009 we identified the potential of new revenue growth for newspapers through subscription-based models. Since then, we've expanded our support and customized product offerings for all clients and prospects interested in pursuing a paid subscription solution for their TV product(s). We're finding through experience that one size definitely does not fit all. Our experience shows that the more customized and localized the solution, the more successful and sustainable the new product will be," says John Dodds, FYI Television's Vice President of Newspaper Sales. As Reflections of a Newsosaur noted in August 2010: subscription based products are "a trend that is likely to gather momentum as publishers forsake the ancient, one-size-fits-all newspapering model in favor of producing portfolios of print and digital products tailored to selected consumers and advertisers." "Today we see more and more clients seeking ways to generate incremental opportunities for added revenue. It has been our experience through helping our newspaper partners that subscription-based TV Book models are a key ingredient to offering readers tailored choices for expanded material of interest without adding staffing, circulation and printing costs. Subscription-based TV models help do just that while providing the opportunity for the newspaper to increase revenue substantially," says Christopher S. Stark, President and CEO of FYI Television. FYI Television's rapidly growing list of clients offering subscription-based TV listings products include The Richmond Times-Dispatch, Idaho Statesman, Savannah Morning News, Amarillo Globe-News, Detroit Free-Press, Minneapolis Star-Tribune, Centre Daily Times, Macon Telegraph, The Oakland Press, The Saratogian and Troy Record and many more. It seems the trend of newspapers exploring and switching to a subscription-based TV product will not be going away any time soon. FYI Television, Inc., today's premier TV listings provider, was formed as a publishing and television information company providing products and services to satisfy customized TV listings information needs for Online (internet), Onscreen (television) and Print (newspapers, etc.) applications. Today, newspapers, cable TV, satellite TV and internet portal industries turn to FYI for their TV listings content. FYI's distinguished client list includes Verizon FiOS, AT&T U-Verse, Disney, Microsoft, NBCUniversal, and Time Warner Cable. FYI delivers daily, weekly and monthly television listings to clients in easy-to-read and easy-to-use formats. These custom and localized services are designed to meet individual client and subscriber interests and needs. Our information technology systems offer clients reliable, accurate and up-to-the-minute updates with quick turn-around times that are unmatched by any data source or competitor. FYI continues to grow its state-of-the-art software and technology in order to offer clients an array of services such as digital internet guides, ad insertion software applications and pagination options to ensure the highest quality of TV listings in the industry. Located in the heart of Dallas/Fort Worth, FYI boasts an international client database serviced by the daily maintenance of over 12,000 TV stations. Easy 24/7/365 access, daily updates, applications designed to meet customer needs, and products for nearly all mediums are just a small part of our "Customer First" philosophy. FYI knows better than anyone that every market, application and client has individual needs and challenges. With a multi-level classification system, we stand ready to conquer those needs. Learn more about our products and services at www.fyitelevision.com. Or, you can request specific information by clicking this Get Info link.